Blade Runner 2049 (2017. 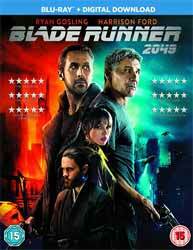 2 hr, 43 min, 27 sec) is a dystopian science fiction film, directed by Denis Villeneuve and a sequel to Ridley Scott’s Blade Runner (1982). In this future we follow K (Ryan Gosling), a Nexus 8 and a Blade Runner who works for the LAPD. He is hated or dismissed by the humans because he is manufactured, also because of the damage inflicted to society by the Nexus 7’s. He is also hated by his own kind because his job is to hunt and kill them. As the story opens he is sent to a worm farm where a Nexus 7 (Dave Bautista) is living quietly away from humanity. In this world this is not an option so after a brief fight K retires (kills) the Nexus 7. The farm has a further secret. Buried under a tree are the remains of a female replicant that seems to have died during a caesarean section. This has profound implications, suggesting that not only can replicants reproduce, but there is at least one living replicant child born of normal child birth. Tyrell used to boast that the replicants were more human than human, their only limitations was a very short life span, six to seven years, and their inability to reproduce. In the first film the first limitation was overcome with the creation of Racheal (Sean Young), who would eventually end up going on the run with Deckard (Harrison Ford). The suggestion of the film is that these may be the remains of Rachael and if so, Deckard may yet be alive. K become fascinated with the idea that a child has been born and determines to track him/her down. But as he gets further into the mystery he begins to believe that he may be the child. K's character is central to the film and Ryan Gosling’s performance is nothing short of mesmerising. K lives an isolated life and I do not think that his name is just random, rather it is an oblique reference to the K who appeared in three of Franz Kafka’s stories, all stories of isolation and alienation. K is not completely alone in his world as he has an AI companion Joi (Ana de Armas). At home the two re-enact what they think are the normal routines of an ordinary life. Unknown to the two, in truth this is a very human thing to do, pretence replacing real emotions. One of the central questions the film explores is the importance of memories. The replicants are implanted with false memories to make their responses more human and like his relationship with Joi, K starts to question just how can he tell the difference between reality and the simulation of reality. It is partially his own memories which start to make him question his place in the world. However, his quest potentially has consequences, leading to the question as to whether K is willing to give up the Joi (sic) he currently experiences for an uncertain truth. Even if he finds a truth how will he know it is not another replication. Encouraged by Wallace (Jared Leto) to find the child Wallace gets his own unique Nexus, Luv (Sylvia Hoeks) to oversee K’s investigation and bring in Deckard, if he can. Wallace wants the secret of replicant reproduction. Here the film posits another question for the audience in just how far will Luv (sic) go to defend what it believes is right and will K have to kill Luv (sic) to finally gain his freedom. The film is a visual masterpiece from set design, costume and the outstanding cinematography. Rather than go for a high tech look the ambience is very analogue, and the sense of reality is heightened as the film used only minimal green screen using real locations and practical effects. The world building is phenomenal. This is the Blade Runner world thirty years on from the original and the world has only gotten worse, with over population and pollution slowly killing humanity. If you’ve seen Arrival (2016) you’ll know that Villeneuve does not spoon feed his audience, expecting a certain amount of intelligent interaction from them, and Blade Runner 2049 is no different. The film offers up multiple layers of meaning with repeated viewings offering up more things to discover. The film was not a commercial success and failed to reach the four hundred million it needed to break even. There are many reason but the most compelling problem the movie had was its length. The film never feels like a long film, which is great for the audience but for cinemas it meant that they could not show it as many times as say a film of ninety minutes. The film looks impressive on the Blu-ray and the disc comes with an English/Russian/Spanish and Thai DTS-HD master Audio 5.1 track as well as a twenty different language subtitles. The disc also contains an English Audio Descriptive Service. For once there are some good extras, worth watching. Designing the World of Blade Runner 2049 (21 min, 55 sec) looks at the design aesthetic, how it follows on from the first film and how it strove to give the film its own unique look. There are three Prologues, short films made by other directors which bridge the time gap between the first film and this one. All three are presented by the director. 2022: Blackout (15 min, 45 sec) is an anime segment directed by Shinichiro Watanabe who had provided a short story for the The Animatrix. The story shows what happened when the Nexus models decide to cause a blackout and destroy their information so that they could never be found. 2036: Nexus Dawn (6 min, 31 sec) directed by Luke Scott and shows Wallace presenting his totally obedience Nexus 8 in an effort to lift the prohibition of their creation. 2048: Nowhere to Run (5 min, 49 sec) also directed by Luke Scott, this time we follow Sapper Morton, the replicate who owns the worm farm that K visits at the start of the movie. The vignette shows how difficult it is for replicants to just have a normal life. When he comes to the defence of a mother and daughter his actions seal his fate. The last extra, Blade Runner 101 (11 min, 42 sec) is a series of six vignettes which cover various aspects of the new world. I remain impressed with Denis Villeneuve, as a director of intelligent science fiction. The film not only matches its predecessor, in many ways it surpasses many of the things which people loved about the original. It may not have been successful at the box office, but Villeneuve has produced a masterpiece which will more than weather the test of time.